Friendly Reminder: Since we are selling on multiple platforms, the popular item like this one runs out really quick, so please don't wait, order it ASAP before others do! The new SERIES 5000 has been designed as a new series of vehicular antennas for 27 MHz or 10m HAM band to assure very good performances and high power handling. Thanks to its coil made of big section copper wire, TURBO 5000 and PERFORMER 5000 can bear very high powers up to 1500 Watts countinuous or 5000 Watts short time. It's very important to make use of the correct cable, in particular, we recommend to use a teflon RG303 for power more than 600 Watts to guarantee your tranceiver's life. The whip is made of 17/7 PH stainless steel and all the metallic parts are of chromed brass to get the best robustness. 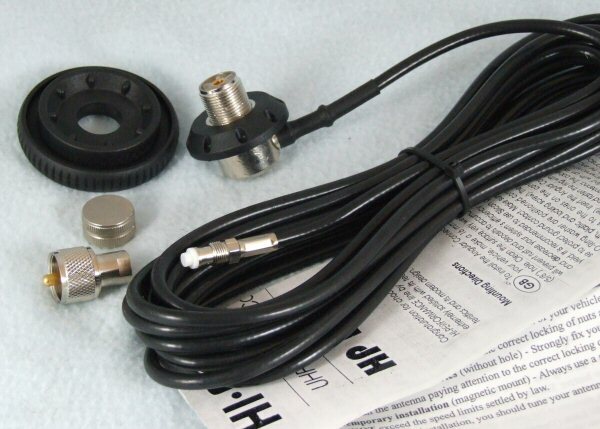 The Non-PL model are standardly supplied with 4m cable RG58 C/U for hole installation but they can be also fitted on magnet mount or brackets supplied with UHF connector.